In my Post of March 11, The 21st Century Library is More: Business-like, I outlined several business model strategies that librarians can implement to create an organization that CAN compete in the digital information marketplace. I won’t repeat those here, but let me add that being more business-like is not a “mission” of the 21st Century Library. It is an important strategy to adopt to be able to achieve the transformation into a 21st Century Library. WORTH REPEATING – Libraries are staying as vibrant, dynamic, and popular as ever by redefining the business they are in. AGAIN – Libraries are staying vibrant, dynamic, and popular by redefining the business they are in. POINT – In order to redefine the library business, librarians MUST understand business principles and how to implement them in their library operation. What business is your library really in? There is a classic business management theory illustration regarding a company that reinvented itself and adopted innovations for over a century. For the purposes of the illustration it is commonly called the “Conestoga Wagon Company”. The average Conestoga wagon was 18 feet long, 11 feet high, and 4 feet in width. It could carry up to 12,000 pounds of cargo. It was used for many types of travel including passage to California during the California Gold Rush. The term “Conestoga wagon” refers specifically to this type of vehicle, and is not a generic term for “covered wagon”. Five German immigrant brothers became blacksmiths and foundrymen in South Bend, Indiana, in 1852. Their Company first made metal parts for freight wagons, but their vision later expanded the Company into the manufacture of complete wagons. The first major expansion in their South Bend business came from their being in the right place to meet the needs of the California Gold Rush, and westward expansion that followed. In 1858 the business was booming because of a big order to build wagons for the US Army. Expansion continued from manufacture of wagons for westward migration, as well as for farming and general transportation. During the height of that migration and wagon train pioneering, the Company built about a quarter of the wagons used, and manufactured the metal fittings for another quarter of wagons built in Missouri, and did so for another quarter-century. As years passed the Company was making and selling all types of horse-drawn vehicles. The wealthy could buy for $20,000 a “four-in-hand” (buggy was the generic term of the time) smart enough to carry a dozen “swells” in style, with red wheels, gold-plated lamps and yellow trim. In 1889, incoming President Benjamin Harrison ordered a full set of Company carriages and harnesses for the White House. Shortly after 1900, as the automobile was gaining popularity, the Company had to re-examine its wagon business in light of the new technology. Early on they had evolved from wagon parts to wagon making, and adopted distribution of parts to other makers. They also expanded their business to include the variety of vehicles the public desired, and filled various market niches. To their great credit and vision, the brothers determined that they were not just in the wagon making business, but rather in the transportation business. At first, they opted for electric (battery-powered) over gasoline propulsion. While it attempted to manufacture its own electric vehicles from 1902 to 1911, the company entered into body-manufacturing and distribution agreements with two makers of gasoline powered vehicles, and beginning in 1904, they began making gasoline-engine automobiles. The Company survived the Great Depression, but massive discounting in a price war between Ford and General Motors proved too costly for independent carmakers in a post-War economy. They struggled for decades to survive and made many automobiles as a small manufacturer. 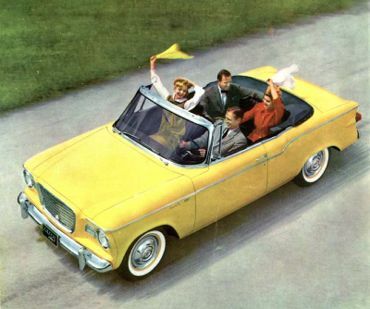 The Company’s last successful automobile was the unique “compact” Lark in 1959, based on old chassis and engine designs. But, the Lark was a clever enough design to be quite popular in its first year, selling over 130,000 units and delivering an unexpected $28.6 million profit to the automaker. However, Lark sales began to drop drastically after the big three manufacturers introduced their own “compact” models in 1960. Another example of the Company’s innovation and vision, the Lark had provided a temporary reprieve, but nothing proved enough to stop the financial bleeding against overwhelming competition. What other skills / knowledge would you recommend for 21st Century Librarianship?